You can now own a Brilliant Uncirculated 2017 Quarter Sovereign, completely free when you purchase your sovereign set. Never before has the London Mint Office presented its customers with such an incredible offer especially as this is the first time in 200 years, this new sovereign design has been created by a member of the Pistrucci family. Here at the London Mint Office you can claim this rare opportunity to own a free solid gold BU Quarter Sovereign. For any collector of exclusive coins, owning a 2017 Gold Sovereign set is simply a must. Now is the time to take your opportunity. Own any one of our spectacular sovereign sets and get your Solid Gold BU Quarter - completely free! 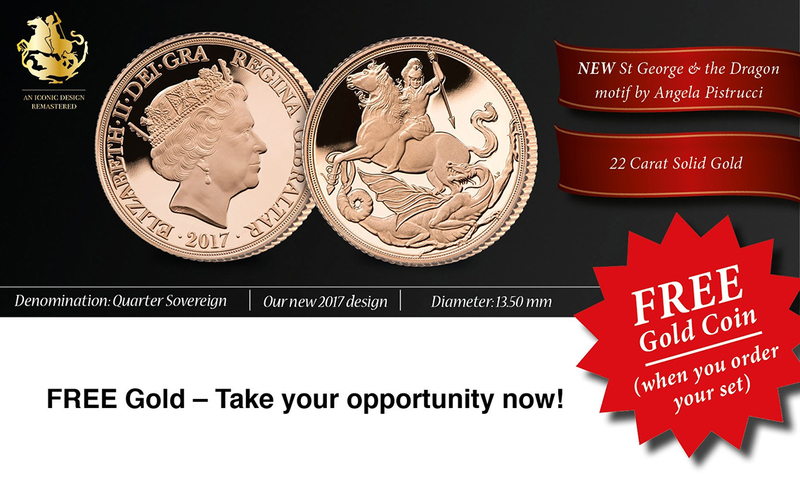 There are so many sets to choose from, a customer care representative is waiting to take your call and make your decision even easier, and of course advise you how to get your free Solid Gold Quarter Sovereign.